This year from June 13th–16th over 30,000 Young Living members from across the globe came to Salt Lake City Utah to celebrate Wellness, Purpose and Abundance. After beautiful tributes to the life of our founder, D. Gary Young, by his wife Mary and sons Jacob and Josef, members of the Executive team announced these amazing new products. We are so excited to share them with you now! Diffuse Freedom in the evening and unburden yourself from your daily troubles. Massage Freedom directly behind your ears, on your wrists, or on your temples for a grounding and liberating aroma to inspire emotional freedom. Apply Freedom topically to your feet every night to enjoy a balancing aroma. Inhale Freedom directly and seek a moment of relaxation. Add 2-4 drops of Freedom and 1 cup of Epsom salt to a warm bath to invite reflection and peace. Use Freedom daily as a personal fragrance to support feelings of inner peace, focus, and confidence. Freedom is an exclusive D. Gary Young blend created for and shared exclusively at the 2018 International Grand Convention. Rise above life’s concerns with Freedom. With its refreshing notes and grounding tones, any day can seem a little less burdensome with the aroma of Freedom. Start your day with meditation and this freeing fragrance on your temples to inspire feelings of freedom from everyday troubles, or sink into bed with its earthy presence for a balancing aroma that may help with occasional sleeplessness or restlessness. Freedom’s relaxing aroma will rejuvenate you and inspire confident feelings to step into your day with emotional freedom! *$3.00 will be donated to the Young Living Foundation. Caution: Keep out of reach of children. For external use only. Keep away from eyes and mucous membranes. If you are nursing, taking medication, or have a medical condition, consult a health professional prior to use. Do not use this product if you are pregnant, planning a pregnancy, or could possibly be pregnant. Avoid direct sunlight or UV rays for up to 12 hours after applying product. When D. Gary Young formulated an oil blend, he did it for a purpose. When he selected the oils for Journey On—originally developed for the World Peace Caravan—he was about to embark on a journey to unite others in bringing peace to the world. 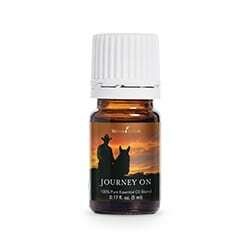 Now, Young Living and the Young family are pleased to share Journey On as a commemorative oil blend to honor Gary’s life, his vision for peace and unity, and his passion for essential oils. This inspiring aroma is herbaceous, earthy, and includes a careful selection of powerful oil blends, including Dream Catcher™, ImmuPower™, and Motivation™, along with Copaiba, Cinnamon Bark, and Peppermint essential oils. Its beautiful, grounding aroma is meant to inspire people everywhere to celebrate what makes us unique, showing greater understanding and compassion for one another. Use this inspired blend to be motivated in your personal journey toward whole-life wellness. As we remember Gary, we recall his mission to educate the world about essential oils and to ultimately transform our world into a peaceful, well society. The purpose of the caravan continues as we identify our own personal journeys, bring joy and harmony into our own lives, and share that peace and purpose with others. Let Journey On be a daily reminder of Gary’s vision and impact in your life as you create a sense of personal peace and spirituality. Embrace Gary’s legacy and take your journey on. Topical: Dilute 1 drop with 4 drops of V-6 or olive oil. Test on a small area of skin on underside of arm and apply to desired area as needed. Caution:Keep out of reach of children. If you are pregnant, nursing, taking medication, or have a medical condition, consult a health professional prior to use. Avoid direct sunlight or UV rays for up to 12 hours after applying product. Diffuse at home or work for a relaxing, woodsy aroma that helps create an uplifting environment. Add to V-6™ Vegetable Oil Complex and massage into skin after a physically intense workout to help soothe fatigued muscles. Apply topically to chest for a refreshing respiratory experience. 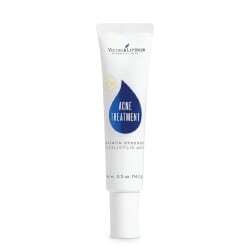 Add to your daily skin care routine and apply topically to face to help reduce the appearance of blemishes. 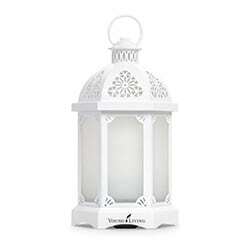 Diffuse to help purify the air from unwanted odors. The extracted Kunzea essential oil has comparable properties and uses to Tea Tree oil but offers a more pleasant aroma and milder sensation when applied topically. It contains a high level of alpha-pinene and eucalyptol, so it works to help soothe fatigued muscles and reduce the appearance of blemishes. When diffused, it helps create a relaxing atmosphere and creates a refreshing respiratory experience. Caution: Keep out of reach of children. For external use only. Keep away from eyes and mucous membranes. If you are pregnant, nursing, taking medication, or have a medical condition, consult a health care professional prior to use. MightyPro’s Wolfberry Punch flavor provides a sweet and tasty experience, whether added to food or drink or directly dissolved in the mouth. 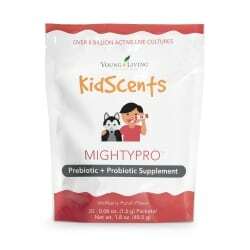 Packaged in convenient, single-serve packets to ensure the freshness and efficacy, MightyPro requires no refrigeration, unlike some other probiotic supplements. Directions: For children 2 years and older, empty contents of 1 packet into mouth and allow to dissolve. Take 1 packet daily with food to provide optimal conditions for healthy gut bacteria. Can be combined with cold food or drinks. Do not add to warm or hot food or beverages. Keep out of reach of children. Do not exceed recommended dosage. If you are pregnant, nursing, taking medication, or have a medical condition, consult a health professional prior to use. 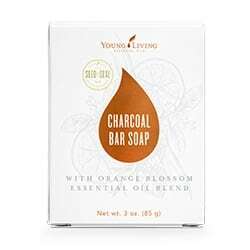 Made with the powerful absorption properties of activated charcoal, Young Living’s Charcoal Bar Soap pulls out dirt and impurities without stripping the skin’s natural moisture barrier. Its naturally derived formula includes powerful skin-cleaning agents, moisturizing ingredients, and the bright, fresh scent of our Orange Blossom essential oil blend. Use it for your body to cleanse and deodorize, or add it to your skin care routine. The unique benefits of charcoal soap make it an especially suitable face soap for combination, oily, or acne-prone skin to help maintain a clear, healthy-looking complexion. Work soap into a lather with water. Apply generously to face and body; rinse thoroughly. Store in a cool, dry place. Energize your beauty routine with Young Living’s Orange Blossom Facial Wash. Made from 100 percent naturally derived ingredients, this face wash for sensitive skin reduces surface oils and removes dirt and makeup without making your skin feel overly dry or tight. Orange Blossom Facial Wash is a hypoallergenic, gentle face wash for oily skin and leaves behind no pore-clogging residue, so it will perfectly complement your daily skin care regimen. After use, round out your citrus-kissed day with Orange Blossom Moisturizer. Wet your face with warm water. Put a small amount of Orange Blossom Facial Wash into the palm of your hand and gently rub into your skin; rinse and pat dry. 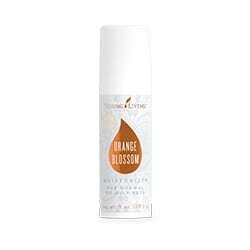 Follow with Orange Blossom Moisturizer to help skin feel soft. Mirah™ Lustrous Hair Oil is a versatile multitasker that can be used as a styling aid or hair treatment. Designed with every hair type in mind, it smooths and rids hair of flyaways and frizz and makes hair silky, shiny, and smooth. The essential oils provide a fresh, floral scent, while Argan, Abyssinian, and Monoi oils help add body and keep your style sleek. Mirah Lustrous Hair Oil is also 100 percent plant based and naturally derived. It contains no parabens, sulfates, phthalates, petrochemicals, animal-derived ingredients, synthetic preservatives, synthetic fragrances, or synthetic dyes or colorants. When you choose Young Living products like Mirah, you can maintain your natural beauty without compromise! Apply a small amount to damp hair, from mid-length to ends, before blow-drying or air-drying or smooth through dry hair to eliminate frizz and create a shiny finish. Keep out of reach of children. For external use only. Keep away from eyes and mucous membranes. Give the delicate skin on your face the gentle care it needs with Mirah Luminous Cleansing Oil! Formulated with ten essential oils, including Rose and Ylang Ylang, as well as ten moisturizing carrier oils, like jojoba and argan, this facial cleanser removes pore-clogging impurities without stripping away the natural oils your skin needs. Simply massage into skin to dissolve makeup and other impurities. Rinse with warm water and you’ll be left with nothing but fresh, moisturized, glowing skin—no need to worry about parabens, sulfates, phthalates, petrochemicals, animal-derived ingredients, synthetic preservatives, synthetic fragrances, or synthetic dyes/colorants. Apply 2–3 pumps to dry hands and massage onto face to cleanse and remove makeup. Rinse off with warm water. We know the pop of color is hard to resist, but trust us—it’s worth the wait! Add drama to your look with a swipe of Savvy Minerals MultiTasker. 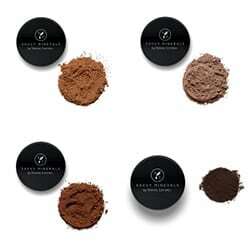 Richly pigmented, this deep and dark brown shade is perfect as an eyeliner, eye shadow, or brow filler. Our mineral-based Savvy Minerals by Young Living™ MultiTasker has a fine texture that blends beautifully for a smooth, even, and buildable application. 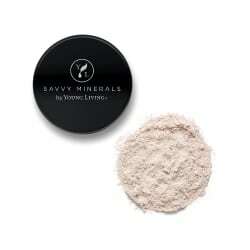 Complete your flawless look with a touch of mineral veil setting powder from Savvy Minerals by Young Living™. A sheer, mineral-based formula, Veil’s luminizing formula applies smoothly and easily, creates highlights, and blurs fine lines and pores for a glowy, airbrushed finish for all skin tones. Wear our mineral veil powder on its own for a sheer, no-makeup look or over foundation for a more polished look. For best results, apply with a brush. Sprinkle a small amount of Veil onto its jar lid. Dip the brush into the lid to pick up the powder, then lightly tap the brush handle against the side of the lid to remove excess. 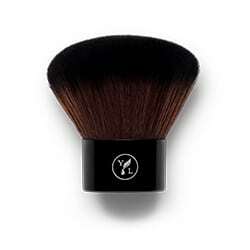 Apply the powder on the brush to your skin in small circular motions, blending well. Gear up for any kind of day with the sweet crunch of Gary’s True Grit® Einkorn Flakes Cereal! Einkorn Flakes Cereal is a lightly sweet, nourishing morning meal that the whole family will get excited to wake up for. Made with whole ancient grain einkorn and oat bran, Einkorn Flakes Cereal is crispy and lightly sweetened with coconut sugar. It also has higher levels of protein, trace minerals, and lower gluten levels than hybridized, modern wheat. Whether you need a way to fuel up before a busy day or want to sneak a late-night treat, Einkorn Flakes Cereal will be your go-to cold cereal choice. With a subtly sweet and bran-like taste and a crunch that lasts even in milk, Einkorn Flakes Cereal has a natural sweetness and crisp that will please the whole family. Since the inception of Young Living’s einkorn product line, Gary Young wanted to develop a cold cereal that everyone will enjoy—and Einkorn Flakes Cereal fills that need. To create a cereal that doesn’t turn soggy in milk, each flake has a minimal coating of coconut sugar. It adds the perfect amount of sweetness and keeps each bite crispy the whole meal through. Pour a serving of cereal into a bowl and add your favorite choice of milk. For a delicious twist to your morning cereal, add Ningxia wolfberries or fresh fruit to your cereal. Contains: Wheat (Einkorn); Manufactured in a facility that also processes dairy, wheat, tree nuts, and soy. Gary’s True Grit® Einkorn Berries are a great way to enjoy einkorn in its simplest form. 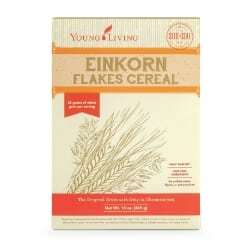 Einkorn grain contains only 14 chromosomes, compared to the 48 chromosomes in modern, hybridized wheat. More than 10,000 years ago, before flour became highly processed, families gathered around homecooked meals created with this ancient grain. Gather your own family around the table for wholesome meals made with farm-grown heirloom einkorn berries! This subtly sweet ingredient can be used as a base for salads or as a wholesome porridge on cold mornings. It can be enjoyed whole by preparing it similar to rice, or you can mill it into fresh einkorn flour. Free from artificial flavors, colors, and preservatives—and with lower gluten levels than modern, hybridized wheat—einkorn berries are great for the whole family! Young Living is proud to help bring the wholesome simplicity of einkorn back to its rightful prominence in the world and at the heart of your home. Diversify flavors in your favorite dishes with subtly sweet einkorn berries that the whole family will love. It’s a great substitute for quinoa and processed flour. Einkorn berries’ low gluten levels may even offer a better option for those who have gluten sensitivities. As pure as einkorn can get, Gary’s True Grit Einkorn Berries offer the whole kernel, consisting of the bran, germ, and endosperm. These berries hail from the roots of a simpler life, when people relied on homegrown food. Offering einkorn in its purest form lets you experience this product directly from Provence, France, and our fields at the Skyrider Wilderness Ranch in Tabiona, Utah, right in your home. 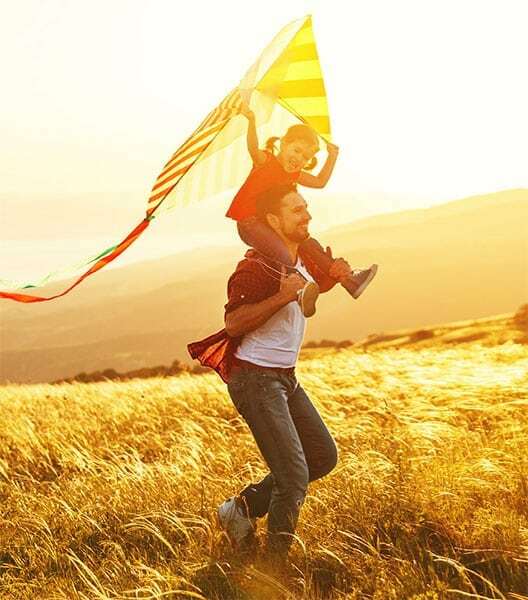 This connection of “life from the land” is at the heart of Young Living Founder D. Gary Young’s legacy. Bring 3 cups of water to a rolling boil. 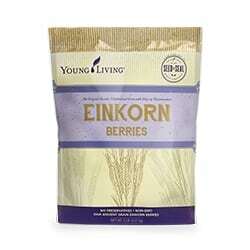 Add 1½ cups of einkorn berries and simmer on low for 25-30 minutes. Caution:Contains wheat (Einkorn); Manufactured in a facility that also processes dairy, wheat, tree nuts, and soy. Storage: Keep in a cool, dark place. This is not a ready-to-eat food; it should be fully cooked before consumption.